We were on vacation the last two weeks and I missed participating in the Five Minute Friday. I wasn't planning on doing this past Friday, but the word was perfect for me this time. Even though it is Monday I still wanted to write about my MAIL. We were on vacation for eleven days. We visited family, spent one day at Sea World San Diego, went to the beach five times, and some other random things. It is always fun to go, but I always look forward to coming home. One thing that is always waiting for us when we get back is mail. We put a vacation hold on our newspaper, so the day we returned we had a pile of papers waiting for us. We also put a hold on our regular mail. And I very grateful for my neighbor who grabs any UPS or FedEx packages that arrive. 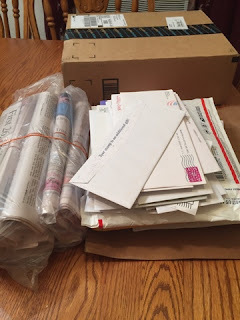 This time there was a lot of junk mail, four review items, a birthday card for my oldest daughter, a few catalogs, magazines, sale adds, and of course a few bills. At least I already paid those through my bill pay. When we come home from a trip I always sort the mail beside the trash can. Sad to say, but most of what we get ends up there. That five minutes went by really fast. It's always fun to get mail after vacation because there is a greater chance that something in there will be fun and not a bill or junk mail. Our mail comes through a grey box and since our recycle bin is outside much doesn't even come into the house.